RV Handicapped Lift by Coach Lift® is a chair lift engineered for durability and ease of use and to eliminate the need for widening the RV door. It is installed on the exterior of the RV next to the entrance door. The user sits on the lift chair, pushes the hand-held control button, rises gently on the vertical lift tube, and swings the chair through the door opening into the interior of the RV. The double-hinged design of the swing arm allows the durable aluminum chair to turn to any angle for easy loading. We understand that each persons situation is unique, therefore, customizing is a regular part of our business. Our handicapped lift operates with a reversing twelve volt DC motor that is powered by the RV accessory battery. It can be installed on most RVs with minimal modification to the RV. The lift must be supported at the bottom by a metal bracket that is firmly attached, (welded and/or bolted), to a solid member of the RV structure. The top of the lift tube is attached by a bracket through the exterior wall of the RV, using a metal backing plate on the inside wall. The swing arm and chair assembly extend 19" into the interior of the RV. If the RV does not have an automatic floor extension that covers the step well area, it is necessary for the installer to fabricate a step well cover so that the lift user does not fall into the step well area while stepping off of the lift chair onto the RV floor. When traveling, the chair and swing arm assembly is easily removed, and stowed inside the vehicle. 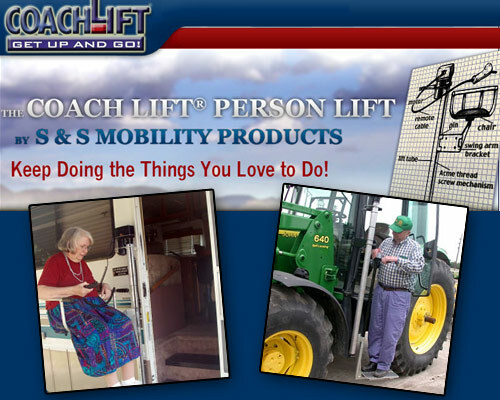 Coach Lift Person Lifts are available for farming, construction machinery and transport trucks. Both the chair option and the platform option are available, depending on the ability of the user. To determine the length of tube needed for each application, measure the height from the ground to the standing platform or seat of the vehicle. Custom Coach Lift tubes are available up to 12 feet long. The portable Coach Lift® for aircraft uses its own 12 Volt battery. It does not connect to the aircraft power system. The weight of the entire lift is approximately 75 pounds (excluding the battery). The lift tube is mounted on a base that rolls up to the aircrafts entry door. There are brakes on two of the wheels for stability. The person needing access to the aircraft sits in our lift chair. The user pushes a button on the hand control and the chair rises on the lift tube to the height required to enter the aircraft. The swing arm and chair are maneuvered through the door and the person steps off the chair onto the aircrafts floor. If the person is unable to stand, he or she transfers into the aisle seat. The lift is disassembled and stowed in the baggage compartment for use at the aircrafts destination.